Jobs for sale: The Commodification of Youth Unemployment in Nigeria – Okolobi! A lot has been written in the media regarding the recent tragedy of 19 reported deaths and scores of injuries which resulted from the mass recruitment exercise of the Nigerian immigration service (NIS). This post attempts to situate the discourse within the broader context of government’s responsibility, recruitment practices and the morality of charging unemployed youth for applying for work. First let me provide some background. 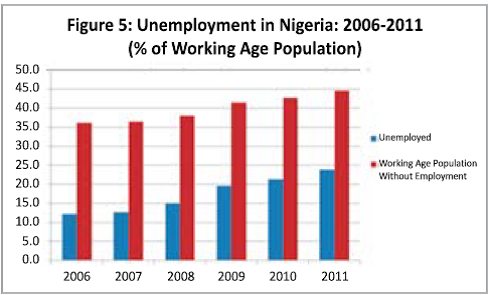 Nigeria’s overall unemployment rate was approximately 24 per cent in 2011, up from 12 per cent in 2006 and 38 percent for youth aged 15-24. According to a study published by the National Bureau of Statistics (NBS) in December 2013, youth (age 15-35) unemployment is now around 54 percent. This is paradoxically bizarre, given high official economic growth rates put at 6 – 7 percent. It is further interesting when situated within the context of recent claims that the Nigerian economy produced 1.6 million jobs. The Nigerian Economic Report published by the World Bank in 2013 in fact suggests that this is more absurd when it is considered that the nation’s growth is in the so-called ‘pro-poor sectors’ such as agriculture. This is perhaps why the government tagged the 2014 budget as a budget for jobs and inclusive growth. Growth that results in more jobs being created is what Nigeria needs more than anything else and the government has a central role to play in this regard. It is the responsibility of governments to provide the right environment for jobs to be created. Some would even argue that it is the responsibility of governments to create jobs. What’s however important is for government to simplify processes of business registration, licensing and tax registration, provide tax incentives, wherever possible, to subsidise loans for upstarts and provide grants. Further to this, governments should invest in education and skills development, as a means to prepare the young people for the labour market. All these are contained in various policy documents and reports from a variety of institutions. In summary, the task of job creation is one in which the government is undoubtedly a key player as the custodian of citizens’ wellbeing. As contained in section 14, sub-section 2b of the 1999 constitution ‘the security and welfare of the people shall be the primary purpose of government.’ This aptly captures my sentiment. This is why it is troubling when government institutions start to cash-in on youth unemployment by asking unemployed young people to pay application fees for jobs they may not get. The trend is now growing, from state governments to federal agencies, especially uniformed services. As pointed out in an earlier article, various government institutions charge varying sums from young people who are unemployed to apply for positions. Perhaps the agencies misunderstand the point of recruiting people. First of all, these agencies recruit because they need the services of the young people (or at least that’s the assumption). Therefore, their aim should be to recruit the best hands. Unfortunately, the best hands may be excluded by the simple fact of their being unable to afford the fees. Secondly, it is not, in my view, the responsibility of the recruiting institution to charge any fees. In fact, they should reimburse costs associated with taking part in interviews where applicable. There are however two exceptions where fees could be charged. The first is where an individual choses to utilise the services of a recruitment agency as a means to enhance their chances of finding and/or applying for jobs that match their qualification and experience. In this instance, the fee paid is usually for a given period or to explore a given number of potential employment opportunities. Note that the emphasis here is on choice, which means that the individual could choose to approach the employer directly – if they have the relevant information. The second is the use of ‘employment brokers’ as practiced in South Africa where companies engage contractors to recruit casual labour on their behalf. In this instance, the private contractors deal directly with the employees and all aspects related to their employment including recruitment and payroll. As far as I know, the notion of labour brokering is not a popular with labour unions in South Africa. Also, for years civil society and labour unions both in Nigeria and South Africa have resisted the casualization of labour. Given that government operates on the basis of laws, policies, procedures, guidelines, circulars, directives, etc, my first question is whether there are enabling laws or such like that allow government agencies to charge fees for recruitment, and if in fact government agencies are allowed to engage a third-party in recruitment processes. The Civil Service Handbook of 2009 appears to suggest that the Civil Service Commission is responsible for recruitment into positions from level 7 and above, while lower positions are the responsibility of the respective Ministries and agencies. This point needs to be clarified, particularly in the light of recent revelations that President Jonathan has set-up a committee to re-conduct the NIS recruitment exercise. Should this be the President’s role? Is there clarity in law or relevant guidelines regarding who should conduct recruitment? Still on the point of recruitment, why did the NIS have to invite so many people (reportedly over 500, 000 across the country) for a test when the available positions were only just over 4,000? What did it aim to achieve by having the test? What kind of outcome did the NIS hope to achieve by conducting such an important test in stadiums? Perhaps to stretch this a little further, why did the NIS believe that conducting a psychometric test was the best avenue for recruitment into such a sensitive agency? Is there a particular empirical basis for the NIS’ decision to conduct the tests with such large numbers of people all at once – rather than stagger the test in batches? It would be interesting to know if the test environment was deliberately chosen as part of an evidence driven examination of performance under stress. Even so, could a better approach have been taken – say for example screen and pre-select those likely to be suitable for the positions available? This NIS tragedy reminds us of the need for reform to create the right environment for the private sector to thrive – by simplifying processes, modifying regulations, providing tax incentives, removing multiple taxation, minimising bureaucratic bottlenecks, subsidising loans to productive sectors, pro-poor sectors and addressing community rent-seeking practices that hinder productivity, put in place or enforce guidelines for recruitment into various government agencies, invest in: skills development (particularly by investing in technical colleges guided by the new TVET Qualifications framework rather than ad hoc ‘skills acquisition programmes’), enterprise development and youth entrepreneurship (perhaps expand the scope of YouWIN?). Many reports have been written – an interesting one being a 2010 World Bank report, ‘Putting Nigeria to work’ which proposes a number of strategies which includes the development of appropriate skills for the labour market. It is hoped that more permanent measures, beyond the setting-up of a committee, will be taken to deal with the immediate problem of commodification of youth unemployment through the sale of scratch cards, and the longer term problem of youth unemployment itself.